I am loving floral for Spring! This sweet top was given to me by Southern Girls Clothing. The material is so soft and the cut is very flattering. This first look is pretty causal. Something I would wear on the weekends. 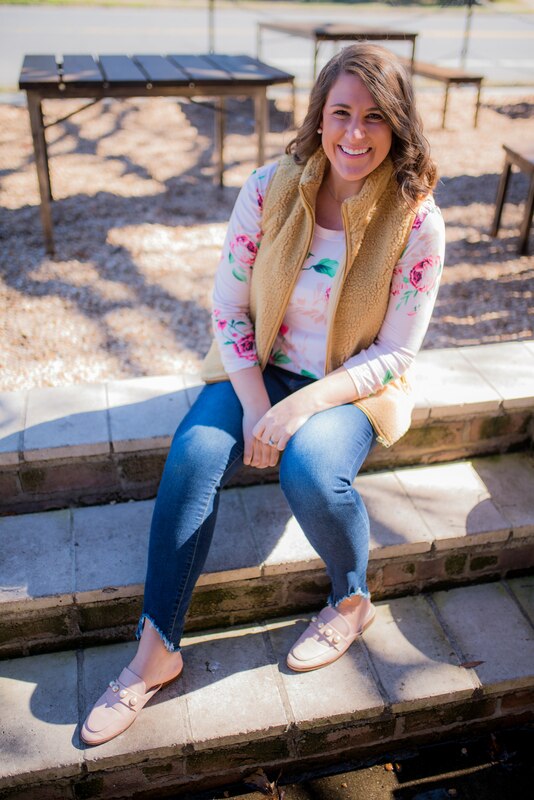 This vest is so cozy and the color is perfect as we transition seasons. I also love these mules because they are so simple. Another great thing about this top is how versatile it is! I easily dressed it up for work with a pencil skirt and blush heels. These shoes are my FAVORITE heels for work. The thicker heel makes them so comfortable. They are not too high and I can easily walk in them. The stud detail is pretty cute too! I am loving this warmer weather and hoping it’s here to stay! Are y’all as excited as I am for the floral trend this year?